If you’re looking for some inspiration for great Christmas gift ideas for men then take a look at some of the following products, especially if that man is obsessed with keeping his skin looking its best. Skin care products may not be the first thing that springs to mind when you think about buying gifts for men but whether they like to admit it or not, most men like a bit of pampering just as much as us women. 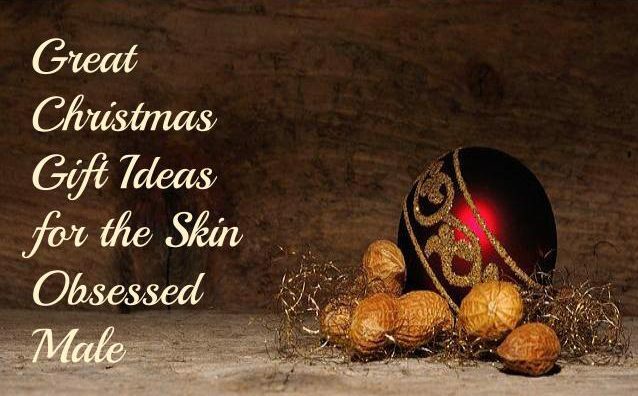 So if there’s a man in your life who you know will appreciate a good skin care gift then here are some great ideas to get your Christmas list started. 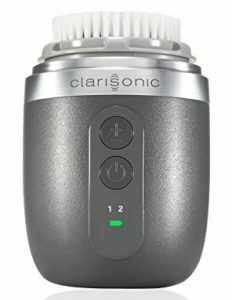 Sonic cleansing brushes have become a really popular skin care accessory recently and now men can have their very own specially designed version which I’m sure us women will probably steal (men’s versions of everything are always better for some reason).The Clarisonic Alpha Fit has been made specifically with men’s skin in mind and comes with shorter bristles that are more effective for thoroughly cleansing tougher skin. This particular brush also oscillates instead of spinning which means less chance of skin irritation. It comes with two settings which is one for clean shaven skin and the other for bearded skin making it suitable for all men regardless of facial hair. The alpha fit is said to thoroughly cleanse and leave skin soft, smooth and healthier looking and like all other Clarisonic devices, the Alpha Fit is completely waterproof. This is a cool little skin care gadget that any man whose into his skin care would appreciate. 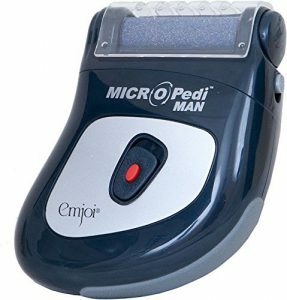 For the men who like to be properly groomed from head to toe, the micro pedi man is an excellent gift idea. This handy sized pedi roller will effectively remove hard, dry and rough skin from the feet with ease. The roller is again made specifically for men and has been made with a coarser roller to treat harder skin. Its design is also somewhat more manly than the usual pedi rollers and if you weren’t looking closely enough, you could even mistake it for an electric face shaver. The rollers are replaceable and if the super coarse rollers that come with it aren’t strong enough, you can always replace them with the extremely coarse versions. Now, here’s a unique gift idea. When you first lay eyes on this thing it actually looks like a real paint can but once you open it up it’s filled with a variety of men’s bath and body essentials. This would be a great gift idea for any man and the best part about it is that you can trick him into thinking you’ve bought him a can of paint for Christmas. This bath and body set includes a bar soap, shaving gel, bay rum oil, hand butter and a body mitt all cleverly concealed within what has to be the most unique packaging I’ve seen yet. 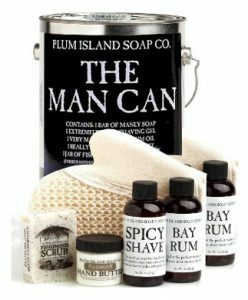 This handmade set contains all natural products and is said to be freshly but manly scented and is sure to put a smile on his face Christmas morning. What more could a man ask for other than his very own manly designed shower puff. O.k, maybe that’s an exaggeration but this little tool still makes an excellent stocking filler nonetheless. 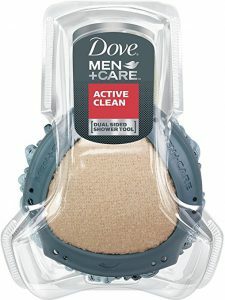 This double sided shower tool has mesh on one side that makes the perfect soapy lather and has a scrub side that is perfect for exfoliating and giving a deeper clean. It’s easy to grip and comes with a hanging loop for easy storage. It may be a simple idea but every man needs his own stuff and I’d be willing to bet that in almost every household, the man’s loofah gets used by every other household member. This little tool is a great way to distinguish his from everyone else’s. 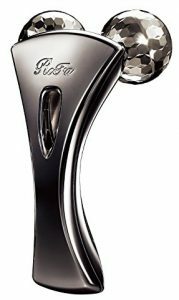 If you really want to push the boat out and surprise him with something really unique then you could always go for the ReFa EXE for men. 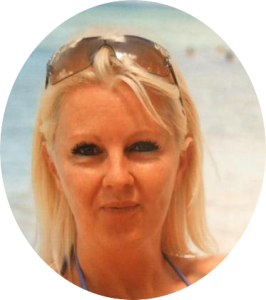 This device is a micro current massager that has a kneading action that is said to help tone and sculpt the skin for better facial and bodily definition. 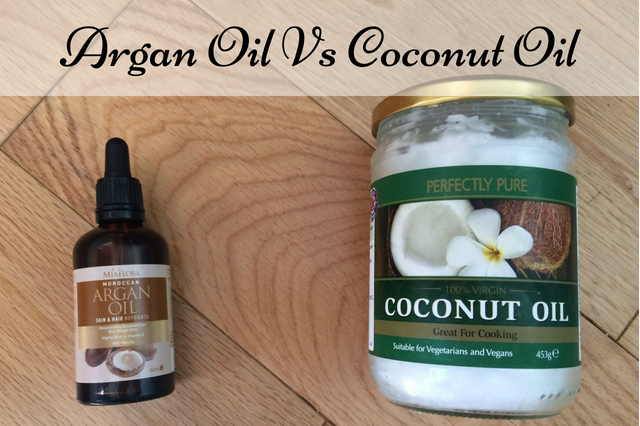 It uses micro currents to boost energy into the skin to help improve skin quality. 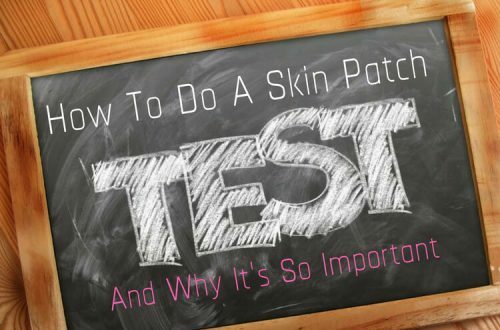 It is also said to be effective at tightening up the skin too and with its kneading action, it doubles as an effective massager. The ReFa EXE is made specifically for men and is easy to use as well as waterproof. It can be used on the face, neck, back or almost anywhere else on the body and it’s appearance alone will have most men intrigued. 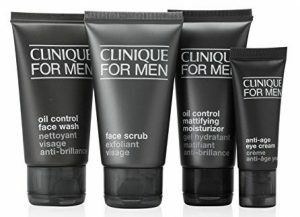 If he’s really into his skin care then how about a skin care gift set like the Clinique great skin to go set for men. These sets are normally somewhat smaller than the normal size products but they’re a nice little treat and are a great way for him to test out some new products. This particular set is suitable for normal to oily skin and contains four pieces which include an oil control face wash, a face scrub exfoliant, an oil control mattifying moisturiser and an anti-age eye cream. They’re also a great idea for the man who’s always on the go as their smaller size make them an ideal travel accessory to smooth and revitalise tired skin. If you’re not a fan of the Clarisonic and instead prefer the Foreo Luna then how about the Foreo Luna 2 for men. The luna 2 is another sonic cleansing brush but with a slight difference. 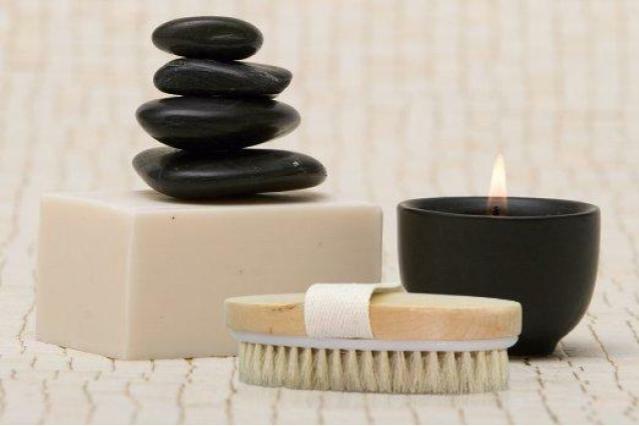 One side is used for deep cleansing and is said to give such a deep clean that it helps prep the skin for shaving and prevents the occurrence of razor burn. 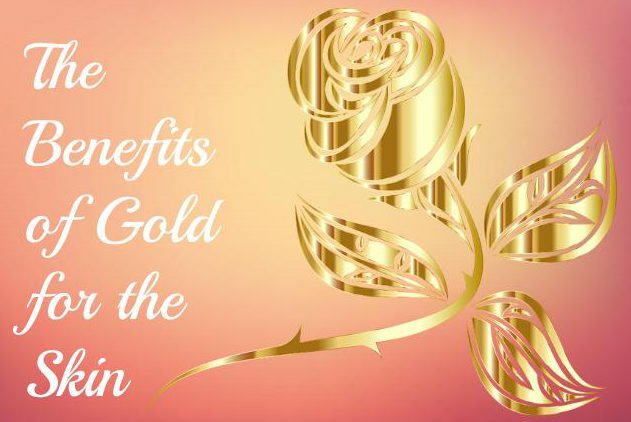 The other side is the anti-aging side and this uses lower-frequency pulsations to help visibly reduce the appearance of fine lines and wrinkles and is said to leave the skin looking firmer and more youthful. It is also extremely cool looking and I think most skin obsessed men would be excited to find this under the tree on Christmas morning. What could be more important to a man than a mirror that doesn’t fog up? Well, probably a lot of other things but I’m pretty sure most men wouldn’t turn a blind eye to a mirror that was guaranteed to never fog up ever. By simply placing a small amount of hot water into a reservoir on the back, that’s exactly what this mirror promises. The mirror is easily mountable with double sided tape and silicone adhesive and is said to be able to adhere to any wall surface. 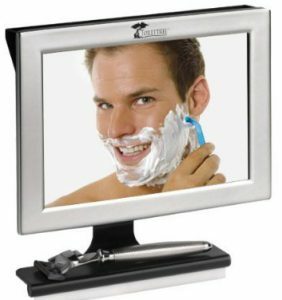 It also comes with a squeegee and a built in shelf to place his razor or other accessories. The bracket is also adjustable so the mirror can be tilted for convenience and with its cool t.v. 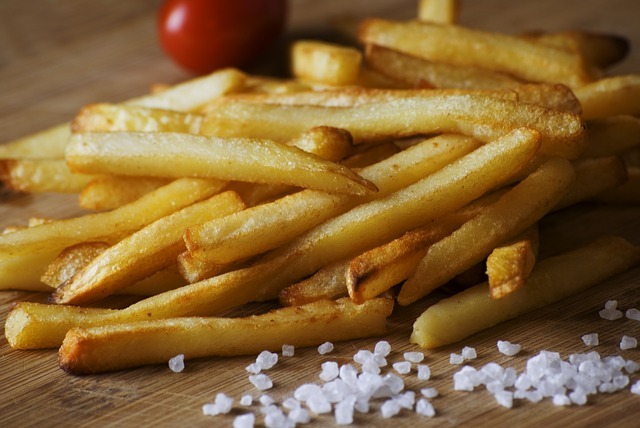 look appearance, it’s sure to go down a treat. If you’re really stuck on what gifts to buy the men in your life for Christmas this year, then hopefully some of these ideas will give you a helping hand. As long as the gift is thoughtful and something you know they’ll appreciate then you really can’t go wrong. Please feel free to leave a comment if you decide to try any of these and let me know if it made his day.